Last week marked the launch of Innovate Finance in London, with the founding event taking place at the Level39 fintech accelerator space at One Canada Square in Canary Wharf. Backed by Canary Wharf Group and with assistance from the City of London, Level39 was created in 2013 to establish London as a leading global center for financial technology innovation. The group is an industry backed organization to promote the fintech sector within London. Consisting of established global financial firms, startups, and industry insiders, the group aims to share and discover ways how technology can become integrated within the financial world to both create new industries as well as improve efficiency of existing products. In addition, working with the government, Innovate Finance plans on helping pave accommodative legislation to allow the use of innovative financial technology within London and the UK. Among areas of innovation being presented during the launch were P2P lending, crowdfunding, and data security firms. Also making itself present were a plethora of bitcoin related firms who were part of the founding 53 members of Innovate Finance. Companies included storage firm Elliptic, merchant processing company GoCoin, and UK bitcoin exchange Coinfloor. Perhaps the biggest endorsement for digital currencies came from George Osborne, Chancellor of the Exchequer. 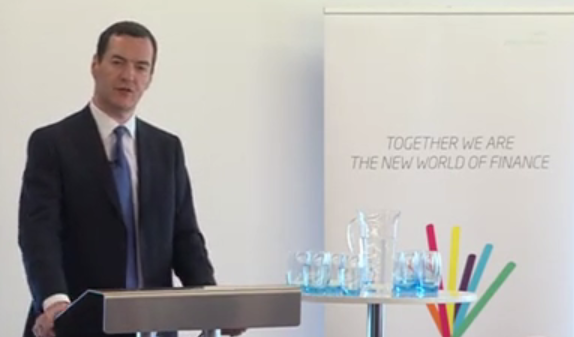 Osborne spoke about how fintech was leading to a new way for the world to bank and handle money. Speaking about the role of government, Osborne mentioned regulation to allow new startups to operate P2P lending and crowdfunding in the UK. In regards to digital currencies, Osborne announced that the “government will start a major program of work exploring the potential of virtual currencies”. The announcement was part of an overall positive mention about the uses of digital currencies as written about last week. Overall, Osborne’s comments, along with the presence of members from the bitcoin sector within Innovate Finance point to digital currencies becoming a key area of focus for fintech in the present and near future.